The CLA45 AMG is the perfect car for the man who wants a CLS63 AMG but also has to live on a budget. Head cranked to the left, right foot planted firmly to the floor, I threw the bright red CLA45 through a sharp right-hander. My hands gripping the Alcantara steering wheel tightly, my heart raced as I pushed myself to the limit to chase down the pack of rabid E63s just ahead of me. I was rather astonished I mistook the CLA45 for a CLS, but that’s how good-looking it is. “Gotta catch them! Go! Go! Go!” I yelled through my helmet to the empty CLA45 cabin. As I crested the blind rise, I saw them. After an initial burst of speed, they were finally within my sights again. I didn’t let off the throttle. The CLA45 churned as hard as it could, making much noise and expelling many carbons. Nearing the final two corners, I caught them. Right now, the average buyer of a Mercedes-Benz car is 53 years old. This worries the Germans. They look forward and realize that if they can’t attract younger buyers from the X and Y Generations, they might not last through the end of the century. Don’t get me wrong; Mercedes’ sales are outstanding. In 50 years, though, without an infusion of young blood, it could be a totally different story. That’s why the CLA is so important to Mercedes. If it doesn’t drop its average buyer age into the 40s, it’s hosed. Understanding that dilemma, let’s look at the CLA45 AMG: the least expensive AMG ever sold and perhaps the most important model Mercedes has ever built. Because it’s going to have to sell a lot of them. When I arrived on the Willow Springs racetrack outside Los Angeles, we journalists congregated behind several AMG cars lined up ready to be raced. There were E63 AMG S-Model 4MATICs in wagon and sedan form, C63 AMG 507 Editions in sedan and coupe and a few – what I determined to be from immediate glimpse – CLS63 AMGs. I put on my head sock and mulled around until the man handing out the keys got to me. “Which car do you want to drive?” he asked in a heavy German accent. “Oh you can have an E63 or a CLA45,” he quickly replied. “Where’s the CLA45?” I asked, looking around almost frantically. “Those there are they,” he said pointing to several CLA45s in both red and gray. With the raise of an eyebrow, he handed me a key and shuffled off to the next journalist. “Man! Those things are great looking,” I hollered to no one in particular. I was rather astonished I mistook the CLA45 for a CLS, but that’s how good-looking it is. It isn’t simply inspired by the $72,000 CLS, but rather a small copy. I first climbed in and ran my hand across the carbon-fiber trim that had been fitted to my track tester. I fiddled with the COMAND system, the screen for which floats on the dash like it does in the G-Wagon. When I heard the engines of the other AMGs fire, I clamored out of my car and pulled my helmet on. I jumped back in and found I no longer fit in the car. Reaching for the seat adjuster, I slammed the seat to the floor. No such luck; my head still scraped the coupe-like roof. As the other cars roared away – desperate not to be left in the dust – I slouched and popped the seven-speed AMG transmission into drive and roared away. Out on the track, I was chasing a fleet of E63s. Although the CLA45 packs the most powerful series production four-cylinder in history – at 355 horsepower and 332 pound-feet of torque – I wasn’t sure I’d be able to keep up. But I tried anyhow. I stamped on the surprisingly soft throttle pedal, and while the Es in front of me bellowed a mighty V8 growl, my CLA45 could only belt out a crackly baritone. I have long derided front-wheel drive. Mercedes, it would seem, has sorted it for good. We came into the first corner and at the first sign of slippage, the CLA45’s AMG four-wheel drive system seamlessly shifted power around from the front two wheels to all four. Although I couldn’t feel it, I knew it was happening. How? I didn’t lose my footing or go off as I hurriedly hurled the little thing through corner after corner in order to keep up with the much more powerful Es. I don’t know if it was my own daring, the weight difference, or the sheer engineering marvel of the CLA45, but after a few corners I caught up the Es and stayed hot on their tails for several laps. If we had been allowed to pass, I would have dared. Not only because – on that day – I was devoid of fear, but also I felt like I had a fight to win for an underdog. Round after head-against-roof pounding round, I kept up with the big boys, shaming many other drivers and impressing only myself. During my time on the track, my profound admiration for the turbo drivetrain was not my only take away, though. The steering on the CLA45 is hugely responsive. A slight movement on the wheel represents a quick reaction from the wheels. Steering weight is light but firm. Braking, too, is impressive. I never felt any fade or give in slowing capability. I went hard over and over on the big AMG cross-drilled discs at all four corners and never feared for my life. 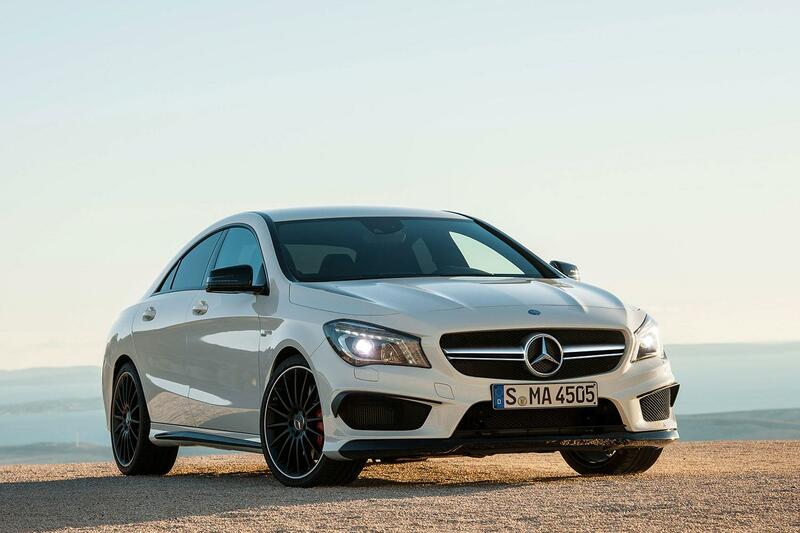 The tech that steals the CLA45 AMG show, though, is the torque vectoring. Computers have sorted out all the detractions of front-wheel drive. I would have never guessed I was racing a front-wheel-biased car. Power delivery was immediate and precise – as was grip. My neck, I’m afraid, was not the only thing that suffered from the track time. The CLA45’s interior did, too. It creaked and rattled more than I had expected it to. Although from a visual standpoint it’s a knockout, it doesn’t feel very substantial. Materials felt shoddy and flimsy. I worried that I could break the climate control knobs if I were clumsy and heavy-handed enough. I also fear the throttle pedal was too light. It had no push back and never made me feel like the throttle pedal position was directly tied to the throttle at the engine. This, I will admit, is a niggling issue. Broadly, the CLA45 wowed me. It literally impressed me at every turn. Yes, the interior might be a bit lacking but your girlfriend and co-workers won’t notice that. They’ll just see you’re driving a gorgeous Mercedes with black rims and red brake calipers. And isn’t that what really counts?